This classic film adaptation by Rosi with Raffaele La Capria and Tonino Guerra of a classic bestselling 1945 autobiographical novel is a 1979 RAI Italian TV miniseries in four one-hour "puntate" (episodes) starring Gian Maria Volontè as the central figure, medically-trained painter and writer Carlo Levi, sent from Turin to the town of Gagliano in remote Lucania as an "internal exile" for three years (reduced to one) by the fascists from 1935 to 1936 for leftist activism. Lea Massari is Levi's practicing doctor sister Luisa who comes to visit and goads him to more social activism, French actor Alain Cuny (of La Dolce Vita and The Lovers is the ultra-religious rent collector Barone Nicola Rotunno and Greek star Irene Papas is earth-mother with 17 children by different fathers, Giulia Venere, who becomes Levi's housekeeper. 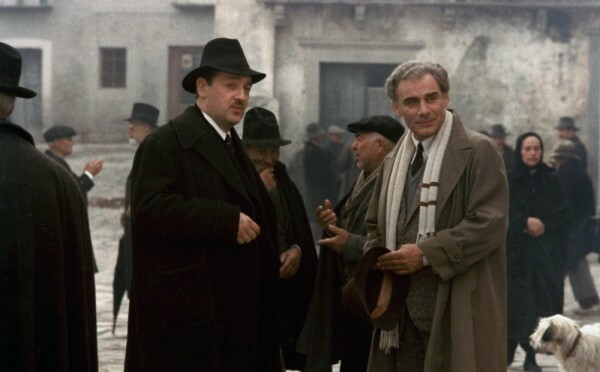 A frequent scene-stealer is Paolo Bonacelli as the pro-fascist local podestà or mayor, Don Luigi Magalone. There is also Don Traiella, the local priest (François Simon, another French actor), who's not the corrupt weirdo the locals think he is. The international cast reflects the times, and was peculiarly possible because of the prevalence of dubbing in Italian films. I watched a preview of the revival of this film mini-epic at Film Forum, where the Rialto Pictures reissue debuts, the first time the "uncut" version has been shown in America. It runs April 2-18, 2019. Views differ on whether this is Rosi's best work or just workmanlike. The score, which is churchy and sentimental, may feel grandiose. The narrative pace may be too measured. But consider how that may work when divided into the four separate "puntate" that leave you time to ponder and think and adjust your own mind to the slow pace of rustic life Levi is adjusting to and finally coming to like as he begins to feel at home in his shared bedroom, with his adopted dog, Barone, eventually with his own studio atop a house to paint in. 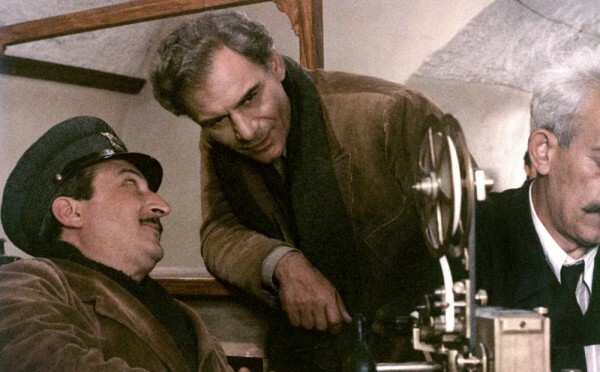 Rosi's film is just old enough to feel itself a bit antique, its sense of the earlier period still convincing, the boxy 1.33:1 aspect ratio, which tends to feel so quaint nowadays, aiding that, and the cinematography by Pasqualino De Santis contributes to a classic feel. When he first arrives accompanied by an official by trains, bus, and antique car (the only car in the region, owned by a returned emigrant to America), the well-dressed, elegant intellectual type Carlo Levi appears to be in for tremendous deprivation, virtually entering a vast prison. One gets the message of the titular saying, "Christ stopped...", meaning this is literally a godforsaken place. But the pace works in that Volonté has elegance and humble gravitas enough to carry the film minute by minute: he's in nearly every shot. He seems either wonderfully polite or saintly. This is both a tale of personal awakening, as Levi is pressed into acting as a doctor for the impoverished town even though he's never practiced and learns to be something to other people and not just his selfish, urban, intellectual self; and an exposé of the impoverishment of rural Italy. The people live by superstition and rituals of mourning. The men of the town have fled, earlier to America, lately to Naples or Milan. (But there is a whole de facto club of older men who have returned, too.) When Levi visits a family, their house has chickens and goats wandering around it: no line divides living room and barnyard. Local doctors are ineffectual, and the pharmacy is in another town. The middle class professionals control an ignorant population, who cheer on Il Duce's empire-seeking invasion of Abyssinia (Ethiopia) mindlessly. But here, Carlo Levi finds a sense of human self-worth he had not had before. Italian Cinema on the other hand was losing much of its former high international market value at the time of Rosi's production. Fellini and Antonioni were winding up their careers, and the great run of Italian cinema from the War to the Seventies, the neorealist classics, the great comedies, Pasolini, was coming to an end. There were the Taviani brothers, there was Lina Wertmüller. But I'm guessing the relative dearth is one reason why there were superlatives from American critics about Christ Stopped at Eboli. Pauline Kael wrote "I was completely absorbed… the audience seemed hushed, as if at a concert where the musicians were playing very softly.” Her acolyte Michael Sragow called it "a secular miracle," "The director’s masterpiece and a stunning introduction to his work." Rialto's publicity quotes film critic David Sterritt: "Best viewed as a meditation, not a conventional drama… An absorbing and sometimes stunningly beautiful movie with an impressive sense of historical detail and social insight." At least with this new release we can grasp it as what it is, a four-part TV drama, meant to unfold slowly. Carlo Levi's autobiographical novel came out in 1945, a decade after the experience it describes. Rosi's four-episode recreation was made almost 35 years after that. This is not first blush but experience recollected in tranquility. A certain faded, becalmed, far-away quality is one of its charms. It is the spirit of exile.